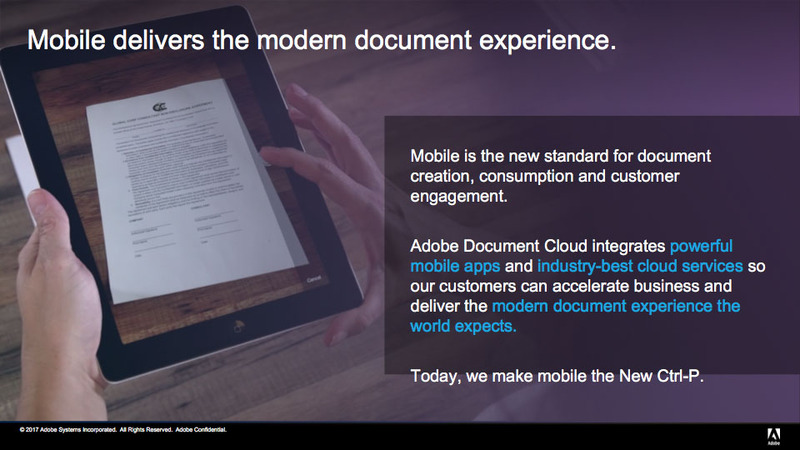 Addressing this need, Adobe (Nasdaq: ADBE) unveiled on June 1, 2017, major innovations in Adobe Document Cloud, delivering intuitive experiences that help people get work done from anywhere. Document Cloud lets you work across its integrated cloud services, mobile and desktop apps. Leading the new line-up are innovations in Adobe Sign, setting a new bar for ease of use and mobility, and Adobe Scan, a new free app that delivers a modern document experience, turning your mobile device into an intelligent scanning and text-recognition tool. Scan anything into high-quality PDFs with your mobile device. Automatically capture a shopping receipt, paper document, business card or whiteboard, or choose an image from your camera roll and Adobe Scan will do the rest. Powered by Adobe Sensei’s intelligent services, Adobe Scan automates boundary detection, auto-crop and capture, perspective correction and auto-clean, removing shadows and making text crisp and clear. Capture scanned text with free automatic text recognition (OCR). Snap a picture of any document or anything with printed text and Adobe Scan will automatically convert it into digital text that can be selected, copied or annotated with Acrobat Reader DC or Acrobat DC. The content then becomes searchable and reusable in a secure and reliable Adobe PDF. 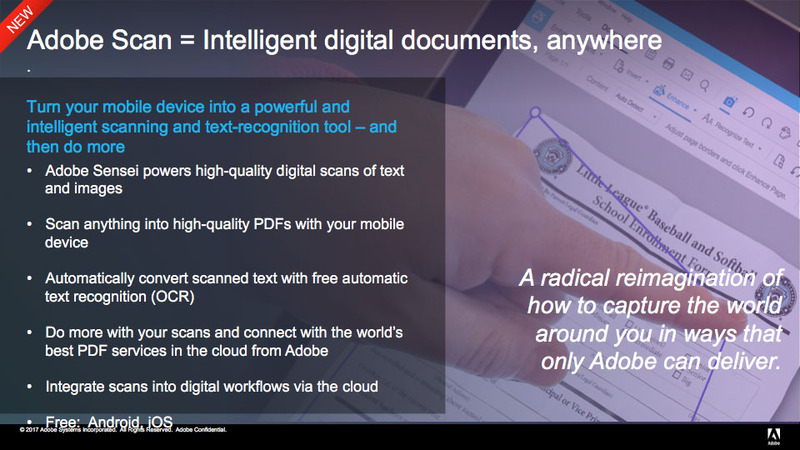 Do more with your scans and connect with the world’s best document services from Adobe. 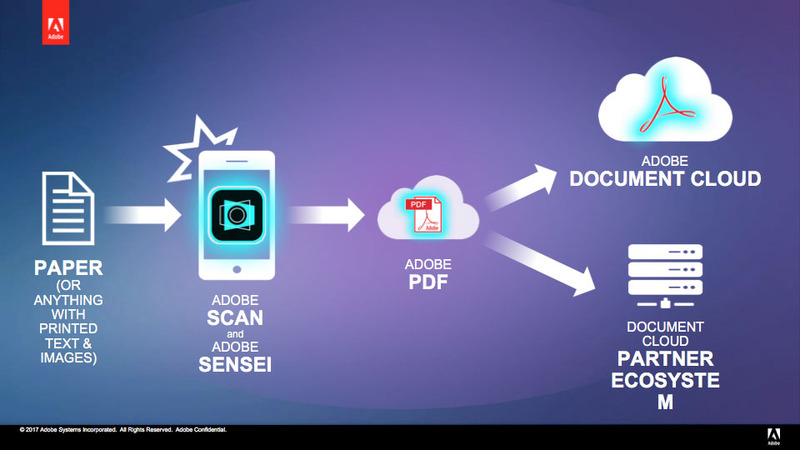 Use the free Adobe Scan app and a free Adobe Document Cloud account to automatically upload, store, share and access your scanned files online. Subscribers to Acrobat DC can also unlock powerful functionality to edit and organize documents, collect signatures and much more. Scan on your phone and upload to Document Cloud to edit on your laptop then continue working with the document on your tablet. And take advantage of new mobile functionality in Adobe Sign to automatically sign and send documents from any device. Next : The AMD Radeon Pro 500 Series for iMac Revealed!